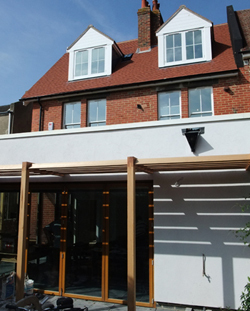 Whether constructing a new dwelling, building a highly glazed extension or converting a building, energy calculations are required in order to demonstrate compliance with Building Regulations and/or Planning conditions. The calculations are based on the Government’s Standard Assessment Procedure (SAP) for the energy rating of dwellings and are commonly known as SAP calculations. Essentially they calculate the energy efficiency and carbon emissions performance of a dwelling. In accordance with Part L of the Building Regulations, your Building Control Officer / Approved Inspector will require a SAP report at the same time as your Building Control Application – this first part of the SAP procedure is called the ‘design’ stage. The second stage of the SAP procedure is called the ‘as-built’ stage and is completed when the building is finished. Together these two sets of calculations provide Part L compliance. Therm Energy can provide the energy calculations your Building Control Officer/ Approved Inspector will request before signing off your project. These SAP calculations are required for all new builds, conversions and highly-glazed extensions for both residential and commercial projects. Moreover we are able to provide energy assessments for Planning applications too – especially where planning conditions are likely to require renewable forms of energy to be included on a project. Therm Energy makes Part L compliance simple and straightforward - keeping customers happy. Please note that Energy Performance Certificates (EPC) are also required as part of the SAP process. Therm Energy are especially experienced in supplying SAP calculations for dwellings with proposed extensions / conservatories / orangeries in which the planned glazing exceeds 25% of the new total floor area. In accordance with Part L Regulations our Energy Assessors will complete two SAP calculations – one calculation based on the existing dwelling plus extension with 25% glazing (notional) and another calculation based on the existing dwelling plus the actual extension (proposed). Together, these two SAP calculations provide Part L compliance for these types of structures.